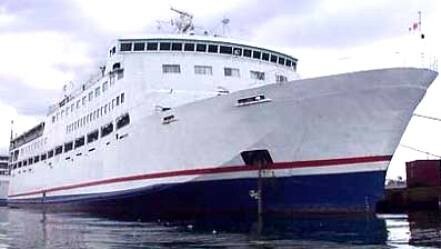 The Princess of the Ocean of Sulpicio Lines was one peculiar ship that plied Philippine waters in the sense that she was a full-pledged liner but was just used as an overnight ferry since her fielding. There were other liners that were passed on to the Visayas-Mindanao routes before her but these happened when they were already old and were already at a disadvantage if used as liners and so they became hand-me-downs unlike the Princess of the Ocean which was fielded in the Cebu-Cagayan de Oro route (the premier Visayas-Mindanao route) from the start and stayed there until she stopped sailing. 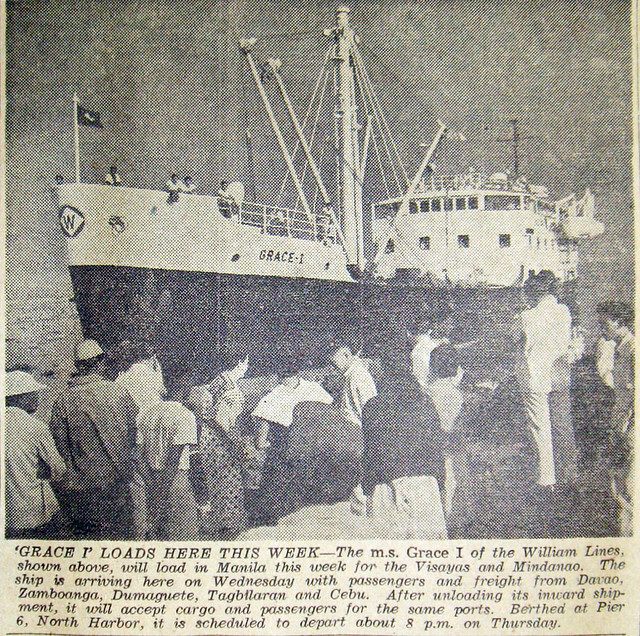 The Cebu Ferries Corporation (CFC) also had a liner that was used in the Cebu-Cagayan de Oro route when it was first fielded, the Our Lady of Lipa but then she was transferred in a liner route which was the Manila-Dumaguit-Roxas route and she was also used in the Palawan route, both of the liner shipping company WG&A. I am really not sure about the motives but one thing is sure is when the Our Lady of Lipa was first fielded in the Cebu-Cagayan de Oro route on Christmas of 1995 is that Sulpicio Lines suffered a blow to their prestige as initially they only had the old and small Cagayan Princess to try to fend off the new competitor and clearly their ship was really outmatched by the ship sailing for Cebu Ferries Corporation, the regional shipping subsidiary of the merged shipping line WG&A. It was more than a year before Sulpicio Lines was able to respond because they prioritized great liners first to be able to hold their own against the onslaught of the giant shipping company WG&A. 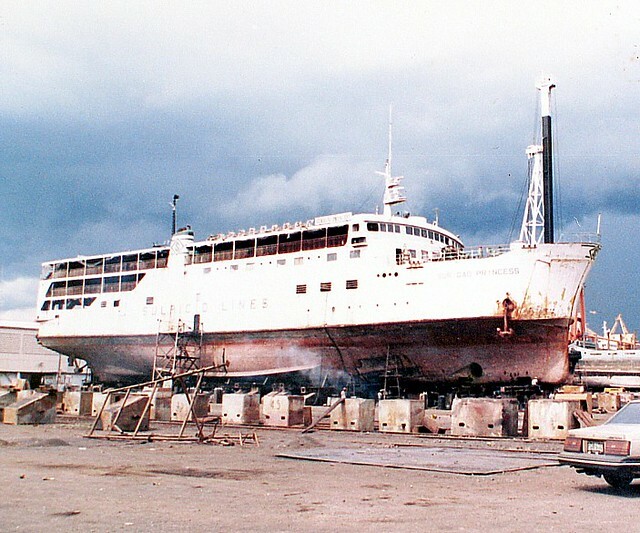 In 1997, they were able to acquire the Princess of the Ocean and instead of fielding her in a Manila route they chose to let her hold the Cagayan de Oro route and maintained her there to probably show who is the boss. I thought at first that the Princess of the Ocean was just for show in Cagayan de Oro but I was mistaken. I was wondering if the ship was not too big for the route or even too speedy (but there were speed contests then to Cagayan de Oro and the bragging rights who got there first). But then a mariner member of PSSS (Philippine Ship Spotters Society) who worked with Sulpicio Lines before told me the Princess of the Ocean had enough cargo in the route including container vans transferred in Cebu from Manila. On the passenger side I really had a doubt if they can fill her 1,938 passenger capacity which was double than the normal Cebu-Cagayan de Oro ferry. I thought then her passengers were really lucky because that will mean they will usually have their choice of bunks with no regard to where they were assigned to. Whatever, the Princess of the Ocean was the biggest regular overnight ferry ever in the Cebu-Cagayan de Oro and also in Jagna, Bohol as she had a weekly voyage there. But sometimes I also wondered if it was not all a waste. To show who is the boss in the Cebu-Cagayan de Oro route, Sulpicio Lines had to maintain the old and obsolete cruiser liner Dipolog Princess in the Manila-Tagbilaran-Dapitan-Iligan route where she was already greatly outclassed by the ships of the competition. And another old cruiser and obsolete cruiser liner, the Iloilo Princess has to hold the Manila-Puerto Princesa route and she was also greatly outgunned there. And this is not even to mention another old and more obsolete liner, the Palawan Princess which does not even have airconditioning. I thought then that the Princess of the Ocean can hold route the Manila-Tagbilaran-Dapitan-Iligan route and maybe the Dipolog Princess can be shunted to the Cebu-Cagayan de Oro route for after all she can also carry a limited number of container vans but not in a RORO deck but above the hull, topside. But then she would be no match to the Our Lady of Good Voyage, the Cagayan de Oro permanent ship of Cebu Ferries Corporation. Now if only the Manila Princess‘ engines were more reliable then Sulpicio Lines would have had more options. And I even thought that with weak engines this ship might have been better used as an overnight ferry as the stress on the engines would have been less. The Princess of the Ocean started life as the Emerald Okinawa of the RKK Lines of Japan. She was built by the Kanda Shipbuilding Company in Kure, Japan in 1974 with the ID IMO 7370454 which means her keel was laid in 1973. She was completed in February 1975 which means she was launched in 1974. Maybe the Oil Shock of 1973 affected her building as it took too long. As her name and company name shows she had a route to Okinawa which is open ocean and that is why she had a great draft especially since she does not only carry container vans in her RORO deck but also topside in her stern. Originally she only had two passenger decks and her passenger capacity was just over 1,000 persons. Externally, the ship measured 126.1 meters in length over-all (LOA) and her length between perpendiculars (LPP) was 118.0 meters. Her breadth was 22.0 meters and her original gross register tonnage (GRT) was 6,150 tons. She was powered by twin Mitsubishi-MAN engines totalling 20,000 horsepower giving her a top speed of 21 knots (which I think is rather low given her power). Incidentally, these engines were also the engines mounted on the much longer St. Joseph The Worker, St. Peter The Apostle and St. Ezekiel Moreno, all of Negros Navigation. The first two had design speeds too of 21 knots while being longer and the last had a design speed of 21.5 knots because she was a little shorter. Actually, the true top speed of Emerald Okinawa might have been 22 or 22.5 knots given that she can do 20 knots here even with added metal in the superstructure. That is if she was not limited by the transmission. The Emerald Okinawa had a sister ship of the same dimensions with her, the Golden Okinawa, also of RKK Lines which also came to the Philippines to the revived Carlos A. Gothong Lines as the Cagayan Bay 1. However, they have different engines as this was only powered by a pair of Mitsubishi-MAN engines with a total of 15,200 horsepower which is the same powerplant in SuperFerry 2, SuperFerry 5, Cotabato Princess and Nasipit Princess. There is also a claim that actually SuperFerry 2 and SuperFerry 5 were sister ships of Emerald Okinawa and Golden Okinawa although those sisters are longer by 12 meters and built by another another shipyard, the Onomichi Zosen but then that claim is very most likely true. 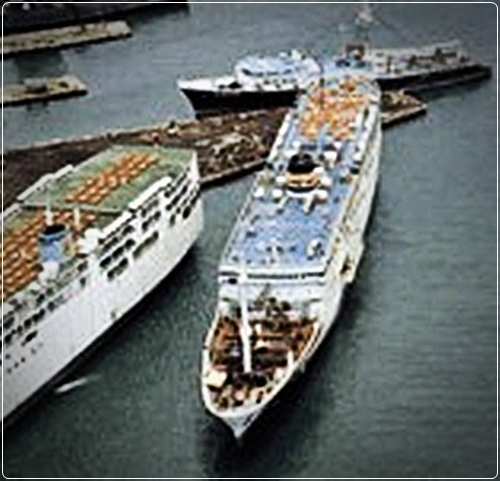 In 1997, the Emerald Okinawa was sold to Sulpicio Lines and she was last RKK Lines ship that came to Sulpicio Lines (RKK lines supplied many liners to Sulpicio Lines before especially fast cruiser liners). She was then 23 years old at that time, three years more than what some falsely claim (because they have vested interests) that in Japan there is a rule that ships 20 years of age are mandatorily retired. A deck was added to her and so she became a three-passenger-deck ship with a passenger capacity now of nearly 2,000. Where before she can carry container vans topside in the stern, now that area had new scantling for the Economy Class. With the way she was rebuilt her stern had the looks now of a square-end stern. Her new depth was 8.1 meters and her new gross tonnage (GT) was 7,297. The ship’s new net tonnage (NT) was 4,218 and her deadweight tonnage (DWT) as registered here was 3,079 tons. Princess of the Ocean‘s TEU capacity was about 90. When she came to the Cebu-Cagayan de Oro route, the Our Lady of Lipa of Cebu Ferries Corporation refused a head-on clash. That would have been a battle royale as they are about the same size (the Princess of the Ocean was a little bigger although their lengths are almost the same) and they have about the same speed that can be sustained which is 20 knots (not over time though). With 20 knots a 2am arrival in Cagayan de Oro is feasible with favorable tide and wind from an 8pm departure in Cebu. Watta way to titillate passengers and afford those with long connecting trips a chance to be in their homes before lunch even though it could be as far as Davao (that was the time when bus drivers still know how to press their pedal to the metal; now that is a big sin). Cebu Ferries Corporation instead pulled out the Our Lady of Good Voyage from her Manila-Dumaguete-Dapitan and Manila-Puerto Princesa routes and she was the one which battled the Princess the Ocean for a long time but at an obvious disadvantage in size and speed and so Princess of the Ocean possessed the bragging rights. But funny the Princess of the Ocean is long gone now but the Our Lady of Good Voyage is still sailing the route as the Trans-Asia 9 (but this might not be for long now). But then who would have foreseen that Sulpicio Lines will quit passenger shipping in the aftermath of the restrictions and public furor caused by the sinking in a strong typhoon of their flagship Princess of the Stars? Who knows if that did not happen if the Princess of the Ocean is still sailing too now? So for 11 years the Princess of the Ocean continued to sail and serve the Cebu-Cagayan de Oro route until the disaster of 2008 when Sulpicio Lines was suspended by the maritime officials from sailing (later the license to carry passengers of Sulpicio Lines was even withdrawn). 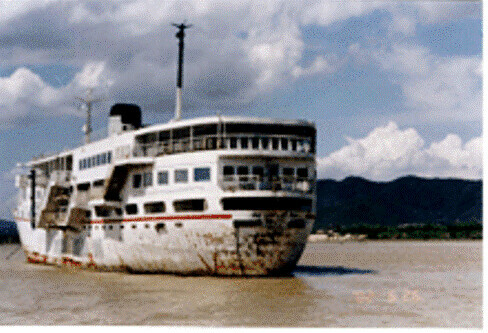 However, there was also a time when she left the route like in the aftermath of the sinking of the Sulpicio Lines flagship Princess of the Orient in a typhoon too in 1998 when she was assigned the Manila-Estancia-Iloilo-Zamboanga-Cotabato route of Cotabato Princess and that was a proof that she can be a liner if Sulpicio Lines chose so. Actually her dining rooms are not the usual that can be found in overnight ferries in the Cebu-Cagayan de Oro route as it is a full-pledged dining area that can sit hundreds at any given time and with the opulence if it can be called that that was handed down from Emerald Okinawa. That also means her galley was ready for a days-long voyages and passengers can be fed free three square meals a day. As rebuilt here the Princess of the Ocean was a little squarish in lines and she had a forecastle. On the sun deck a playground and a promenade were built. She had a quarter-front ramp on the starboard and also a quarter-rear ramp on the starboard as she was designed to dock on the starboard side (there are no passenger ramps on the port side). Of course that quarter-rear ramp can also be deployed if the docking is stern-ways or Meditteranean. Another notable feature of the Princess of the Ocean was she was a bridge-control ship which means her engines can be controlled from the bridge, the reason she had more controls and instrumentation in the bridge compared to the usual liner. In bridge-control ships the navigators also know the actual situation in the engine room. The Princess of the Ocean was a fine liner and a better overnight ship although like in half of the Sulpicio Lines fleet sometimes the maintenance of the facilities lags. When I had two female friends ride with her on the way to a visit to my place they reported some unsatisfactory observations and that detracted from the enjoyment of their trip. Of course on the flip side the fares of Sulpicio Lines are a little cheaper than that of the competition. But then who can believe now that they only charged P187 for Economy and P245 for Tourist in the Cebu-Cagayan de Oro route? That was how cheap it was then. Now if only those fares can be brought back then tourism will fly and the budget airlines will be dead. Whatever, this good ferry was killed way ahead of its time because of the great misfortune that befell Sulpicio Lines which was also a misfortune to the general ship-riding public with the exception of the victims, of course (but the general ship-riding public does not know that except for a few). 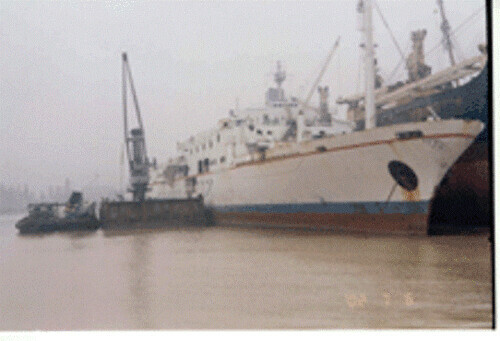 Laid up from August 2008, she was finally sold in the third quarter of 2010 and was broken up on January 23, 2011 by the Jiangmen Yinhu Shipbreaking Company in Xinhui, China. Now all that are left of this peculiar ship are memories and photographs. When I look at and gauge a ferry I do not look only at its size and speed because I am not the “Oooh, aaah” type. I also tend to look at the other attributes of the ship including the efficiency, a quality that can be hard to quantify. But with this attitude of mine I can then appreciate other supposedly “lesser” ships and types. One of the ferries that attracted me was the vessel Our Lady of Sacred Heart of Carlos A. Gothong Lines Incorporated or Gothong for short. She was one of the ferries that brought back Gothong into the Manila route after a hiatus in the aftermath of their split with Lorenzo Shipping Corporation when they just concentrated on Visayas and Visayas-Mindanao routes. At the time of her fielding she might have been the best ship of Gothong. She or her sister ship, the Sto. Nino de Cebu could have been the flagship of Gothong. The Our Lady of Sacred Heart was a former RORO Cargo ship in Japan which means a ship geared to loading vehicles crossing the islands and taking in just the drivers and the crews of the vehicles, primarily and so the passenger accommodations is limited and the amenities are not that complete. RORO Cargo ships are more of the utilitarian type. She had a sister ship which also came here into the fleet of Gothong, the also-well-regarded Our Lady of Medjugorje (the rebuilt former Sto. Nino de Cebu which caught fire) which looks like her. What I noticed about the Our Lady of Sacred Heart was the small size of its engine compared to its size and passenger capacity. She only packs a single Mitsui engine of 8,000 horsepower which was even less that of her sister ship’s 9,000 horsepower. Yet she was capable of 16 knots here which was decent already compared to the other liners of her time (which was around 1990) that were also small. Yet that kind tried to pack it her in passenger capacity and were carrying small engines too and were just running at 16 knots to 17 knots too like the SuperFerry 3 of Aboitiz Shipping, the Tacloban Princess and Manila Princess of Sulpicio Lines, the Zamboanga City of William Lines and San Paolo and Sta. Ana of Negros Navigation. To that class, the Our Lady of Sacred Heart belonged together with her sister ship. Among the ships mentioned, the Our Lady of Sacred Heart has the smallest engine together with the Tacloban Princess but the latter ship was smaller than her. Now imagine a ship with just 8,000 horsepower carrying 1,903 passengers with probably about 90 TEU of container vans. In passenger plus container van to engine horsepower ratio, she might have been tops in this metric or index. That for me is efficiency. What were the origins of this ship? The Our Lady of Sacred Heart, colloquially known as “OLOSH” was built in Japan in 1978 by Mitsui Shipbuilding in Osaka, Japan for the Kuribayashi Kinkai Kisen shipping company. She was originally named as Shinsei Maru with the IMO Number 7718589 and her original dimensions were 112.5 meters by 18.0 meters with an original gross register tonnage of 3,149 tons and a deadweight tonnage of 3,295 tons. This ship has a deep draft and her depth was 12.3 meters. In 1979, however, this RORO Cargo ship was lengthened to 123.0 meters with a length between perpendiculars of 115.0 meters and her gross register tonnage rose to 3,511 tons. However, she retained her original design speed of 17 knots. RORO Cargo ships were never designed to have big engines like the 146.0-meter Super Shuttle RORO 7 has only 6,990 horsepower, the 145.0-meter Super Shuttle RORO 8 has only 7,800 horsepower and yet their designed speed were 17 and 17.5 knots. Well, even the bigger Super Shuttle RORO 11 and Super Shuttle RORO 12 which are both over 160 meters have engines of only 7,900 and 6,500 horsepower, respectively, and they can do 15 and 16 knots. Such is the efficiency of a RORO Cargo ship. In 1990, this ship together with her sister came to the Philippines for Carlos A. Gothong Lines and she was forthwith converted into a RORO-Passenger ship or ROPAX in Cebu. Additional passenger decks and accommodations were built and she became a three-passenger-deck liner. Her gross tonnage rose to 4,388 with a net tonnage of 2,237 and her deadweight tonnage was revised to 4,120 tons. In speed, however, she was down to 16 knots because of the additional metal and she had over a decade of sailing already. She then had her passenger capacity raised to 1,903 persons which was a little outstanding for me, initially. However, I noticed the smaller Tacloban Princess has a passenger capacity of 2,009 and the 138.6-meter SuperFerry 2 has a passenger capacity of 2,643. Meanwhile, the 107.3-meter Sta. Ana has a passenger capacity of 2,106 and the 117.1-meter Zamboanga City has a passenger capacity of 1,875. And so I thought the passenger capacity of the Our Lady of Sacred Heart was plausible even though the passenger capacity of her sister ship was only 1,330 persons. When the Our Lady of Sacred Heart was fielded, she might have been the most beautiful ship of Gothong, externally. One striking features of hers is the long and high quarter-stern ramp which seemed to suggest she can dock in any kind of wharf, low or high. And for those who will notice, she seemed to be missing one smokestack or funnel (since she has only one engine and no false funnel was built). She also have no openings after two-thirds of her length early on. Taken from a website that cannot be remembered now. No copyright infringement intended. In Gothong, the Our Lady of Sacred Heart did the unlikely discovery of the company, the unseemly Manila-Roxas City-Palompon-Isabel-Cebu route. Later this route was extended to Ormoc City. At first I cannot get the connection between Capiz and Leyte and yet she was successful there. It seems that for a long time already, the western Leyte area has been neglected by the other shipping companies and only fielded old and obsolete liners there. Actually her ports of call there are substitutes too for Tacloban port and Ormoc port aside from being a connection to Biliran province. 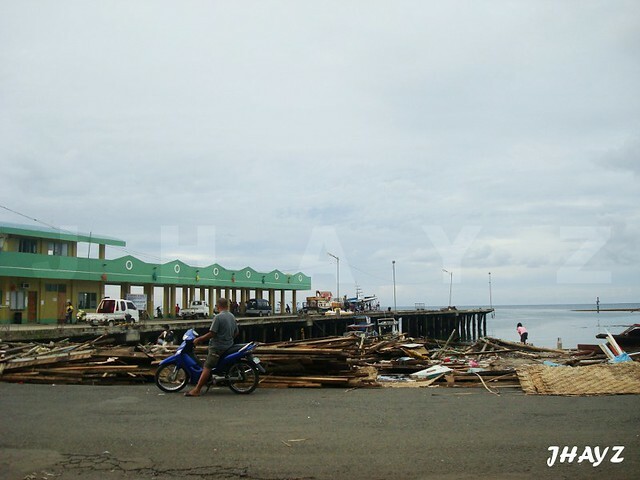 And to think there is even a bus from Ormoc to San Ricardo, the southernmost town of Southern Leyte and so the ship even seemed to be a connection to Southern Leyte. In those times the earlier Manila liners to Leyte have been gone already. The Our Lady of Sacred Heart was the best liner going to Leyte during this time and also probably the best liner too to Capiz. She was doing the western Leyte route until the “Great Merger” that created WG&A came in 1996. When that happened I had some fear for the Our Lady of Sacred Heart as the merger created surplus ships including container ships and even the Zamboanga City which came here only one year before was offered for sale. I know it was the older cruiser ships of WG&A that was more vulnerable but I was worried about the lack of speed of this ferry. At that time 16 knots seemed to be slow already as there was already a lot of ships capable of 17.5 knots and over and there was no way to coax more speed out of the ship with her single small engine. Besides, I am not sure if WG&A really appreciated her route. Actually the company modified the route as soon as the merger happened – Roxas City was dropped and instead Masbate was substituted. Beyond that I also know the intermodal buses and trucks presented a deadly challenge to the ships calling in Leyte ports. I know that if passengers in Samar can shift from the ferries to the buses then it is highly possible that can also happen in Leyte and there is no reason why not. Daily departures and pick-up by their gates without going through the hassles in the port was a very big selling point of the buses. Meanwhile, for factories and shippers in CALABARZON (Cavite, Laguna, Batangas, Rizal and Quezon), trucking in their products is easier, faster and less expensive than in hiring a container van that will fight the traffic and the various illegal exactions in Metro Manila. Soon, the Our Lady of Sacred Heart found herself back in her old route of Roxas City in conjunction with the port of Dumaguit and essentially doing an overnight route. But then not too long after the “master of retreat” WG&A also gave up on this route when the buses and trucks started rolling to Panay island with the creation of the new Roxas, Oriental Mindoro to Caticlan, Malay link. And with that WG&A sold ships again to the breaks but fortunately for the Our Lady of Sacred Heart she was not yet among the unlucky ones. When that happened the Our Lady of Sacred Heart might have been at the bottom already of the new company Aboitiz Transport System, the successor company of WG&A and she was then just a little ahead of her sister ship, the Our Lady of Medjugorje. I thought then already that she was a lucky girl. 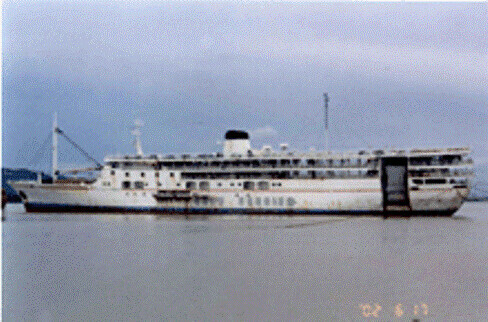 It looked later that Aboitiz Transport Company or ATS was reserving her for the Palawan route which is not exactly a long route and so it suited her and there was no competition anymore when the Sulpicio Lines ferry, the Iloilo Princess burned and Negros Navigation was already headed into financial crisis and had ships seized by creditors. And so the lack of speed of the Our Lady of Sacred Heart didn’t play to her disadvantage. Photo by Jorg Behman. Credit also to John Luzares. It seems the last route of the Our Lady of Sacred Heart might have been the combined Coron and Puerto Princesa route from Manila. By that time she has signs of oncoming problems with reliability and that is deadly for a single-engined ship (well, if the engine can’t be restarted then a replacement ship would have to be brought in or else tickets have to be refunded and passengers simply get angry with that. Besides, the Aboitiz Transport Company was already cutting on routes and that includes her subsidiary Cebu Ferries Company which are doing the Visayas-Mindanao routes. With the pressure of the intermodal system which relies on buses and trucks plus the short-distance ferry-RORO like in Batangas and Matnog, the Our Lady of Sacred Heart has no more short route to go and Palawan was her last possible stand as she cannot be fielded on longer routes like Mindanao or compete in major ports and routes as she is not a SuperFerry. She might have been an efficient ship but she was never meant for long routes nor for major routes. With the addition of the SuperFerry 15, SuperFerry 16, SuperFerry 17 and SuperFerry 18, the lesser SuperFerry 1, SuperFerry 2, SuperFerry 5 and SuperFerry 9 have to go to lesser routes and that included the Palawan route. It was the end of the line for the “lucky” (until then) Our Lady of Sacred Heart. I was just wondering why she and her sister the Our Lady of Medjugorje were not sent to the Visayas-Mindanao routes of the Cebu Ferries Corporation (CFC). They could have competed with the Trans-Asia Shipping Lines pair of Asia China and Trans-Asia (1) in the Cagayan de Oro route (and shift their Our Lady of Good Voyage in another route). Actually, the Trans-Asia pair (and sister ships) were smaller but were utilizing engines even bigger than than the ATS pair at 10,400 horsepower each (and the Trans-Asia pair were older too by Date of Build). Maybe Aboitiz and Cebu Ferries does not want a sister ships to sister ships battle? In speed, the former Gothong sister ships can still match the Trans-Asia sister ships (if they were inferior it will not be by over 1 knot and that doesn’t matter much and they can just depart earlier). Was that the reason why they chickened out? In amenities they can match the highly-regarded Trans-Asia pair. I can see some incongruence here because Cebu Ferries Corporation decided to retain their older and smaller ferry Our Lady of the Rule when that venerable old Gothong Ferry has a same but not identical 8,000-horsepower engine (but twin) when the Our Lady of Sacred Heart was even faster (and definitely more good-looking). But by this time it seems Aboitiz was already bent on shifting to the Cebu Ferries series which might have been faster later because they are smaller ships (their average horsepower was just about the same of the Our Lady of Sacred Heart). On the average that series was shorter than the Our Lady of Sacred Heart by 35 meters. Maybe they do not need the extra capacity as Cebu Ferries Corporation was already weakening in cargo because they charge the highest rates and they were not that proficient in palletized operations which is the norm in the intra-Visayas and Visayas-Mindanao routes. 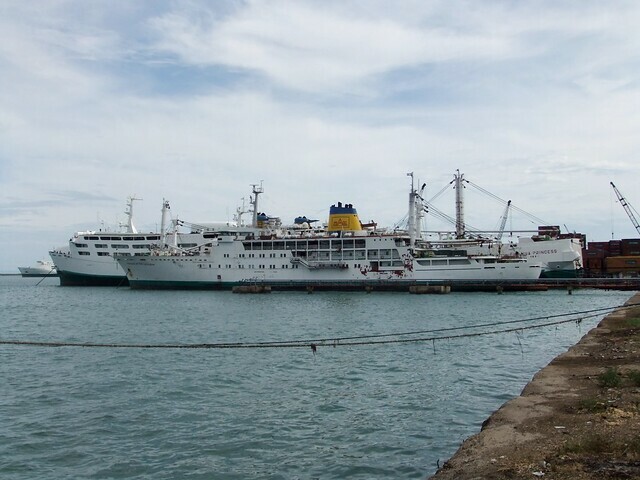 Maybe also there was also the decision already that the Cebu Ferries Corporation will just compete in a few Visayas-Mindanao ports and routes as the company was already outmaneuvered by the competition especially from Cokaliong Shipping Lines Incorporated (CSLI) and Trans-Asia Shipping Lines Incorporated (TASLI) which are good in taking in shippers and making them stick. The near-equivalent of the Our Lady of Sacred Heart, the Our Lady of Good Voyage also outlasted her. This ship has just 400 horsepower less than OLOSH but she is smaller at 109.2 meters and her passenger capacity is only at 1,076 at her bridge is already near mid-ship. She was also among the smaller liners with small engines but she was fielded later although by age she is almost the age of the Our Lady of Sacred Heart and her engines were not much that better. In accommodations she might have even been less than the Our Lady of Sacred Heart. Unlucky this time, in late 2005, the Our Lady of Sacred Heart found herself on a lonely, one-way voyage to face the cutters of the Bangladesh shipbreakers and the ship was broken up in early 2006. She was only 28 years old then, young by the age of ferries of today. That only means she died before her time.